The AGvocate conference provides FFA members with the knowledge and skills needed to effectively spread the important message of agriculture. Louisiana FFA members are given the opportunity to see state government in action on Capitol Day, a one-day event each year held at the state capitol in Baton Rouge. Chapter officers are a critical component of FFA program success. Chapter Officer Leadership Training conferences provide chapter officers with the tools their need to grow their local chapters. Agribusiness is a critical component of agricultural education, and Co-op Camp provides FFA and 4-H members with an opportunity to learn how to manage an agricultural business in a fun, interactive way. Take your leadership skills to the next level by attending your Area Leadership Camp. You will have fun, make new friends, and become the best person you can be. The last line of the FFA Motto is "Living to Serve," and it is a call-to-action that FFA members have answered for almost 100 years. Learn how your chapter can serve you community, state, nation, and world. 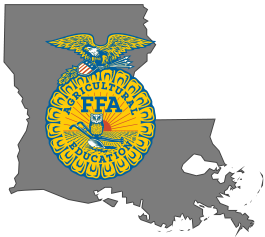 Every year, the Louisiana FFA Association holds our State FFA Convention where thousands of members throughout the state congregate in our host city to celebrate agriculture, FFA, and member accomplishments from the year. The State Leadership Delegates Conference is held annually by our State FFA Officers to train Area Officers (who represent the state as Leadership Delegates) on the Delegate Process, reviewing the issues submitted by chapters. A collection of issues are narrowed down and four are selected to become delegate committees at State Convention. This committee process gives chapters and members a strong voice in determining the direction of Louisiana FFA.